ColorSafe is a filter plugin for Adobe Photoshop and compatible applications that provides fully interactive color pickers for the easy creation of almost limitless hybrid colors from the base colors in the Web safe palette. A hybrid color is formed by combining four pixels of two different colors from the Web safe palette together in an exact ordered pattern to create a third visually distinct color that will not dither across viewing platforms and monitor depths on Web pages. "Take away my ColorSafe and my ProJPEG away, and I quit the whole business." You can purchase ColorSafe now and be confident you won't be disappointed. The cost is only $49.95, or purchase the entire six tool suite in the BoxTop Super Bundle for just $134.95, a savings of well over 50%. The Super Bundle is quite the deal. You can also download ColorSafe and take a look first. ColorSafe is fully functional shareware, and is not limited, other than the usual Annoying Shareware Dialog(TM). Unlimited colors - Any original color can be quickly and accurately matched to a Web safe hybrid color that will not dither and can be used to fill and paint areas of images just as a normal color would be used. All colors are Web safe with ColorSafe, which is of course the greatest benefit of using ColorSafe. Better image quality - The best approach for creating Web graphics is by combining colors from the Web-safe palette with custom colors suited to the specific image at hand. ColorSafe allows you to easily mix Web-safe colors with custom colors for the best compromise of quality and consistency in all viewing conditions. Pick your picker - ColorSafe provides a sophisticated, interactive RGB color picker as the main interface for creating hybrid colors, but you are not limited to it. All system and host color pickers are available to use just as easily at a click of the mouse. From CMYK to HSB, you can pick your color picker poison. A pattern canvas is also available for easily creating larger pattern fills as well. 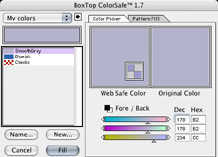 Extreme compatibility - ColorSafe is a filter plug-in that works with all Macintosh, Windows NT/95/98 host applications that very minimally correctly support the Adobe Photoshop 2.5 filter API, which is just about every image editing application available. Everyone can enjoy the benefits that ColorSafe provides. Easy collaboration - You can share your lists of colors with others as easily as exporting them to cross-platform color libraries, which can be used by all other ColorSafe users as easily as importing them. Full Interactivity - ColorSafe is fully interactive and provides the full and immediate feedback you need to create accurate hybrid colors in one try, not two or three. You can also select colors to match from an original image using the foreground and background color matching control. Save time - Everything you do in ColorSafe can be saved. Your hybrid colors and patterns are named and stored in libraries for later use. Libraries can also be shared for easy collaboration on projects. It also initializes to the last used settings each time you use the plug-in even if you have since quit and restarted your host application. ColorSafe is made for efficiency and ease. Purchase ColorSafe right now and you can be using it to make better Web graphics in ten minutes with electronic delivery 24 hours a day, 7 days a week. E-commerce never sleeps, and BoxTop tools are sure to please. The cost is only $49.95, or purchase the entire six tool suite in the BoxTop Super Bundle for just $134.95, which is a savings of well over 50%. The Super Bundle is quite the deal.